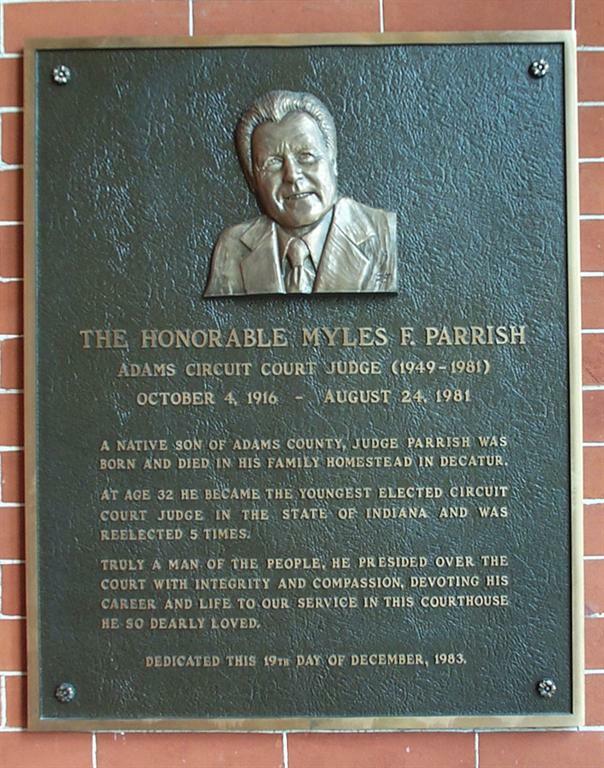 Judge Parrish graduated from Decatur High School, then earned degrees in government and history from Indiana University, Bloomington, Indiana, before receiving his law degree from the IU School of Law. He also attended the FBI Academy serving as a special agent with the Bureau before joining the Navy and serving during World War II. Parrish returned to Adams County after his military service and filed for prosecuting attorney in 1946, defeating two other contenders for the Democratic spot in the election. In 1948, he won the nomination for Adams County Circuit Court Judge in the primary election. After defeating his Republican opponent in the fall election, Parrish became the youngest elected circuit court judge in the state. His distinguished bench career spanned over 32 years and was a position he filled honorably and well for more than half his life. On July 21, 1949, Myles married Beulah Augsburger and they had one son, Franklin (currently an attorney in California). In 1993, Beulah and Franklin Parrish put into place this living monument for the judge – one that would continue to honor his memory for decades to come. Since 1993, this scholarship has been awarded to a North Adams graduating senior.